A new adaptation of Lucy Maud Montgomery’s Anne novels may seem like an odd move, given the Canadian Broadcast Corporation’s pre-existing (and beloved) take on one of the country’s best-known fictional characters. 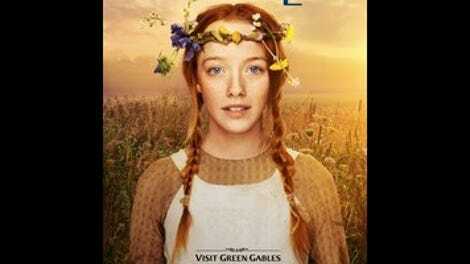 But that series premiered more than 30 years ago, and the characters in Anne Of Green Gables are well-served by this new Netflix release (itself a CBC production), which is at once darker and sweeter than the original. The Anne novels focus on the title character, an orphan who is mistakenly sent to live with an older pair of siblings on Canada’s Prince Edward Island. Marilla (Geraldine James) and Matthew (R.H. Thomson) Cuthbert were looking to adopt an orphaned boy, not a girl, to help out with the work on their farm, but Anne is sent instead. She is a gangly, red-headed preteen, famously talkative and prone to imaginative flights of fancy as well as a love of multisyllabic words. Amybeth McNulty defies her youth with a performance that’s less a portrayal of Anne than an absolute possession. It can’t be easy to make Anne’s fanciful language sing the way she does, and McNulty captures the endearing awkwardness that enables Anne to win over everyone she comes in contact with. James and Thomson are ideally cast as well. The former inhabits the kind-hearted yet stern Marilla, and the latter does the same for the kind-hearted yet nearly silent Matthew. As they’re meant to, Anne and Matthew especially possess an immediate connection, so that it’s easy to see why he accepts her into his home, even though she’s not the boy he and his sister asked for. Anne’s character depends on a lot of chatter, but much of Anne With An E’s strength lies in the series’ many brave silences: when a distraught Marilla can do nothing but furiously scrub floors to alleviate her worry, for example, or a particularly tense dinner where Matthew wordlessly discerns unrest between his sister and their new ward. The humble, pin-neat surroundings of onscreen Green Gables are also likely to resemble what a reader of the Anne novels might have imagined in the first place, and the Prince Edward Island scenery is lovely. The slow pace of the series may take some getting used to—restful for some, likely to bring on impatience in others. But with so much familiarity safely established, Anne With An E confidently veers into some unknown, darker Anne territory. Dark blue-gray-tinged flashbacks depict what Anne’s bleak life was like before Green Gables, in the orphanage or while helping care for impoverished families with many children. While some of these scenes may be disturbing for younger viewers—as they see their beloved heroine in such despair—they also add a valuable, deeper element to the series. It’s easier to see why Anne would consider the modest Green Gables, living with this elder pair, such a paradise, when compared to what she’s used to. It also helps to explain her formidability, as well as her fierce temper and her necessity to cling to her flights of fancy. The series also offers a valuable window for discussion about what life was like for Anne and her friends—with no electricity, cars, or running water—as the simpler conditions in late-19th-century Canada are replicated here in minute detail. In the first few episodes of Anne With An E, the familiar tales resonate—Anne’s quarrel with Mrs. Lynde, Marilla’s missing brooch—enticing new Anne fans the way the original novels did for Anne Of Green Gables in years past.